State Rep. Laura Devlin proudly represents the 134th Assembly District, covering Fairfield and Trumbull. 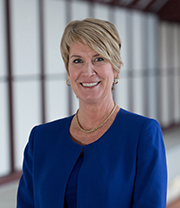 She began her third term in January 2019, Devlin serves on the legislature’s committees on, Education, Finance, Revenue and Bonding and she is the Ranking Republican on the Transportation committee. Aggressively advocated to end the destructive tax policies that are pushing businesses and residents out of Connecticut, to fix and truly fund our state’s transportation system and to ensure clean, open elections. Proudly supported significant environmental legislation, which establishes a Long Island Sound Blue Plan to determine the full extent of the Long Island Sound’s resources and a State Constitutional Amendment to protect state-owned open space lands. Worked to passed bi-partisan legislation protecting college students and parents by creating a ‘Student Loan Bill of Rights’ and younger students with dyslexia who need additional support and help. Growing up, Laura lived in the south suburbs of Chicago with her parents, brother and three sisters. Her mother was an elementary school teacher and her father, an entrepreneur. Laura’s father was also a WWII veteran, having landed at Normandy on D-Day and fought in the Battle of the Bulge. He was a strong, proud man and together with my mother, they raised us all to be independent and taught us to work hard, keep our sense of humor, and put family first. Laura started working at 15 and largely put herself through college, graduating from the University of Illinois in Champaign/Urbana in four years. Shortly after graduation, Laura started her career and moved to New York City. She wasn’t there long when she was transferred to Oregon, Kentucky, and then back to New York. It was when Laura came back to work in New York City that she chose Fairfield as a place to live because it was the most attractive and affordable community on the Metro North New Haven line. As a commuter spending three hours a day on a Metro North train, Laura’s time in Fairfield was limited to late evenings and weekends. So when she left her job in New York and stopped her daily commute, she began to get involved in local school and community events as an advocate and volunteer. In 2011, having become frustrated with the incessant property tax increases and concerned about our Town’s finances, Laura decided it was time to get off the sidelines and do something. She ran for and was elected to Fairfield’s Board of Assessment Appeals and subsequently ran for and was elected to represent District 3 on Fairfield’s RTM, where she also served as a member of the Finance Committee. Laura has lived in Fairfield for over 20 years with her husband and two children.